Another light week this time around. Here’s what I’m looking at this week. 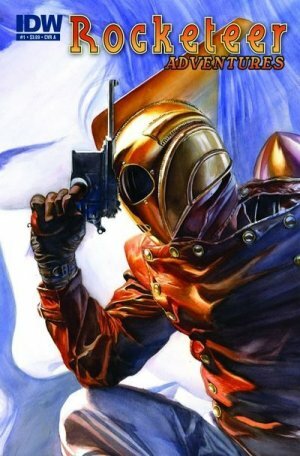 ROCKETEER ADVENTURES #2 (OF 4) – The first issue of the new Rocketeer anthology was a breath of fresh air, with a remarkable opening story from John Cassaday (always a treat to see his art) and a solid tale by Mike Allred. I’ll be anxiously keeping up with this one. SECRET AVENGERS #14 – Secret Avengers stays on the list solely because of Matt’s recent thumbs up. I recently caught up with issues 1-11 (expect a review soon a la yesterday’s) and found it better put-together than New Avengers, but somewhat lacking. I’ll give the next story arc a shot before dropping it, though. X-MEN AGE OF X HC – Is Age of X over already? I remember when I heard about the Age of Apocalypse 15 years ago you could have knocked me over with a feather. Now Marvel does it again and it hardly makes any news at all. I blame the 90 OTHER X-Titles out there diluting the brand. Fortunately, I’ve gotten to read some other new comics over the past couple weeks. 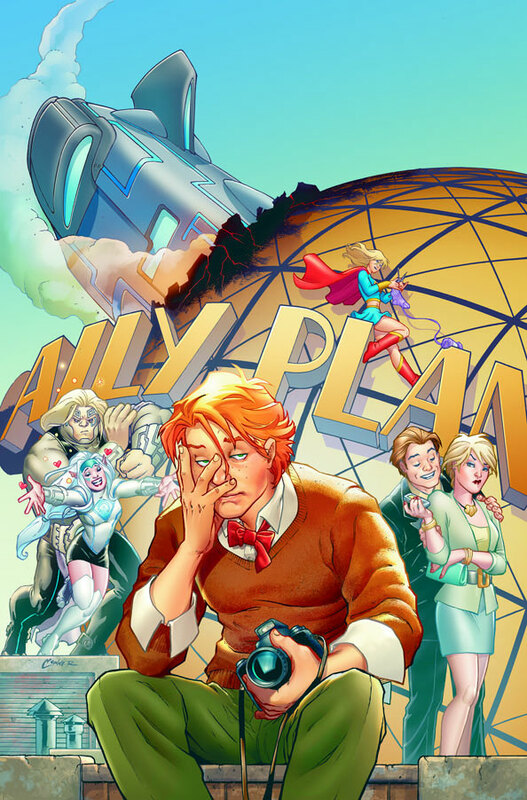 Gladstone’s School for World Conquerors #2 hit the stands last week and continues to bowl me over. I’m not even going to call it an all-ages title anymore, that’s how solid it is. We start off with the book’s strongest scene, a look at the different classes our villains-in-training have to attend, a nice mix of Harry Potter swirled with villainy, then cut to a pretty expansive fight scene where we learn a bit more about the villain’s code, a nice angle in a title where it has to make sense that villains are more organized than you’d expense. Another outstanding issue by Smith and Villavert. I didn’t mean to pick it up, but because it was a light week I did grab IDW’s new Godzilla title, Gangsters and Goliaths. Set in a different continuity than the Kingdom of Monsters title Eric Powell is writing, in this book Godzilla and the gang on Monster Island are already well-known. When a team of gangsters winds up on Monster Island, mayhem ensues. I don’t feel like this is as strong as KoM, but if you’re jonesing for a Godzilla book, G&G is a solid read. Frank Cho is one of the most amazing talents in comic books, and every time he works on a title –no kidding — I feel like the industry is lucky to have him. That said, there are certain bad habits he tends to rely on. 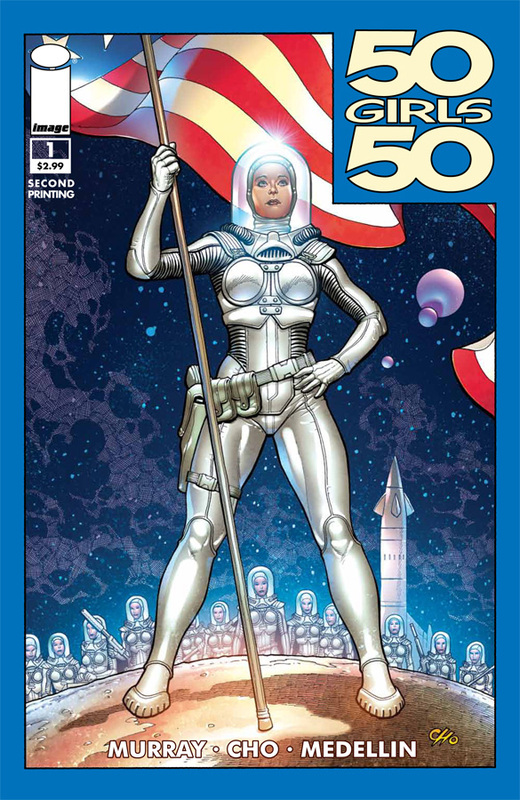 Now, Frank can work on whatever makes him happy (a la Jim Balent on Tarot) and his art is so spectacular that it usually makes up for any perceived definiciencies in the story, but 50 Girls 50 #1 is built around one cheeky idea (hot girls in space wind up having their spacesuits slowly dissolve) and doesn’t have his artwork backing it up*. So, as far as I’m concerned there’s not much worth sticking around for. *There were a couple pages at the end it looked like he worked on, but I could be willing myself to see that. This was a pretty good week. At least for me, issues ran from pretty good to not too shabby. So let’s see what we see. Months and months ago, I dropped Green Lantern because I didn’t want to read a story pretending not to be Dragonball Z or The Thirteen Ghosts of Scooby Doo (ie a story where the characters are on an search for x, y, and z mcguffins over an indefinite period of time). Johns was shoe-horning a hamfisted plot over his search for the dragonba…er…ghos…er avatars of the lantern power. This said, it may be a surprise that I really enjoy Paul Cornell’s Action Comics. Lex is essentially collecting Dragon Balls, but that’s all he’s doing, and he’s doing it shamelessly. Of course Cornell’s/ Luthor’s shamelessness is infinitely more fun to read about. Specific to this issue, Larfleeze shows up with one of the spheres and words are bandied regarding the nature of desire, power, and want. 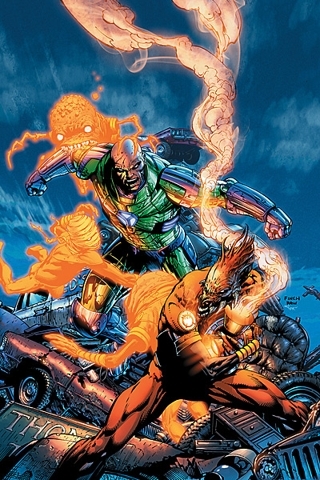 If you’re a fan of avarice and the color orange, the last two Larfleeze pages are worth the price of admission. We also get a clue as to who might be partially responsible for this business. This week also saw a return of something that has not been true in almost a decade: I walked out of the shop with three X-books. In quick order, here are a few thoughts on each. 1. Age of X continues in X-Men Legacy #245 this week. I’m still enjoying this look at dystopia. The X-writers have gone out of their way to create relationships and back stories for characters that we haven’t seen before. Rogue serves a unique and chilling purpose in Age of X that makes sense for her power set. It’s also fun to see Cannonball busting Cyclops’s chops like a drill sergeant to a buck private. The use of Wolverine in this issue and the previous installment of this crossover are also intriguing and well done. Finally, we get glimpses that suggest that readers should not be pulling for Magneto to win the day. Poor Kitty Pride. 2. X-Men #8 continues the teams trip back to New York. I was interested in seeing how the X-Men and Spidey might face Lizard. Now, not so much. It reads similarly to Gischler’s first arc. Find vampire and replace with lizard man. Find San Francisco and replace with New York. Find Cyclops and replace with Storm. Done. There is a mystery as to who is behind all of this reptili-mania (hint: it’s not Connors). If you haven’t picked up the book, go back and read the vampire arc. It’s better and surprisingly more novel even though it’s lacking cannons that shoot vampires from the moon. 3. 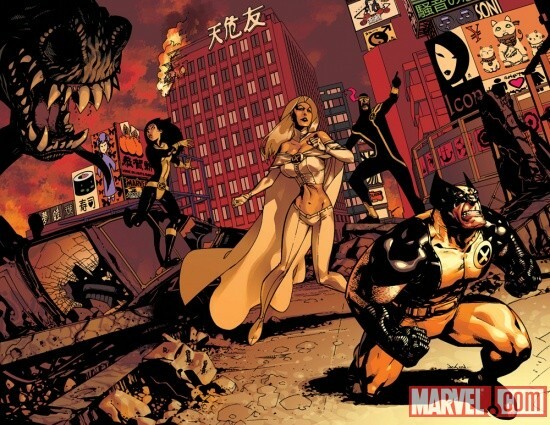 Astonishing X-Men is back, and Daniel Way (of Wolverine, et al. fame) is at the helm. Like X-Men, this issue involves lizards. It also involves, a certain island, Mentallo and Japan. I don’t want to say much more, but I feel confident that Jesse will be picking up to book based on certain words in the previous two sentences…oh, there’s also a death in family, but it’s more of a plot point to get the mutants to Japan. Which brings us to the “final” issue of Fantastic Four. Pardon me if I sound incredulous; twelve issues before a big 600th anniversary and they’re canceling the title? Right. That aside, the issue is enjoyable. It’s not really a memorial for Johnny; rather it shows how each member of the family deals with his death. Valeria’s reaction is chilling, while read has an impotent moment with Anihilus. My favorite moment was watching Ben handle the loss. Hulk and Thor are there with shoulders to cry on in a way that made me a little teary. At the same time, Hickman (as always) is building a foundation. The back up story with Franklin and Spider-Man was decent too in spite of the annoying “Hey there little guy” voice that Peter uses when talking to Franklin. I hate that voice. Finally, there’s Nick Spencer’s Iron-Man 2.0. It was okay. Yeah. So all in all it was a good week to read comics. Hope you enjoyed your stack as much as I enjoyed mine.